Launching soon on the Android market place. 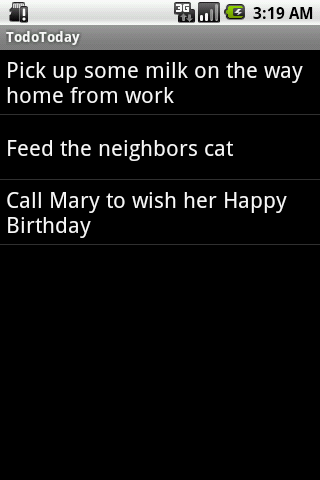 TodoToday is a very simple task manager application to show your current due and overdue tasks from Remember The Milk. TodoToday is intended to be a very light weight todo and task management application to quickly list all of your tasks that have have a specific due date and you need to tack action on them now. TodoToday puposefully filters out any tasks that have no due date, or are not due yet, so you know exactly what you have To Do Today. This product uses the Remember The Milk API but is not endorsed or certified by Remember The Milk. For developing Android application we can also use Google android SDK .This is one of the useful post.Nice information. Get TodoToday for Andoird Today!